A couple of weekends ago, some friends and I, drove out into the country in search of fancy apples. 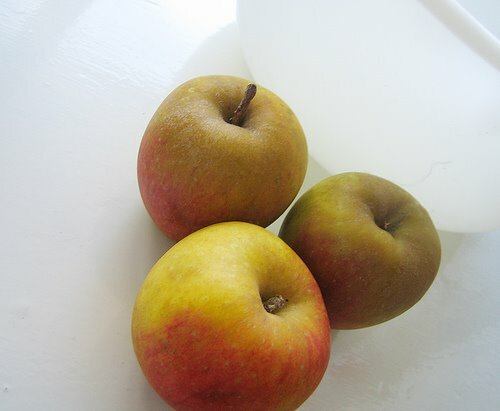 Last year, at the UBC Apple Festival, I had my first taste of a Belle de Boskoop and I was hooked. It was tart and crisp and so beautiful and I wanted some of my very own. I did a ton of online searching and couldn’t find a local grower or any grower period. When I made stops at grocery stores while on trips, I always perused the apple selection just hoping for a sight of that russet beauty. Nothing. Then, I picked up a local guide to farms around the area, and sure enough, Belle de Boskoops were available at an orchard in Langley. I emailed them and they got back to me saying that they only had a few left. When we arrived, I bought a bag full, even though they were past the point of perfection. Sure, they were less crisp than I would have liked, but they still packed a wallop of flavour. And when I described my quest for the perfect apple to one of the owners – that it had to be tart, crisp and juicy – he came back with just the thing: the Sundance. Well, those are my eatin’ apples. The Belles, I left for something else entirely. Like these apple pancakes. And oh, these apple pancakes are perfect. Fluffy and tiny and oh so appley! They are like little apple fritters and perfect for a lazy weekend morning. Whenever I make pancakes, I always end up making too much and while left over batter isn’t the worst thing in the world, I wanted these to be enjoyed just once. It’s winter you know and I shouldn’t be packing on the pancakes. So I just made enough for the husband and me, but please feel free to double up and make enough for an entire family. Whisk together the egg and buttermilk and set aside. In a larger bowl, combine the flour, baking powder, spices, salt and brown sugar. 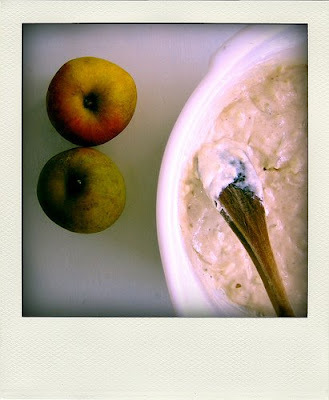 Dump in the milk/egg mixture along with the grated apples and combine until just blended. Don’t over mix. Let the batter rest for 15 minutes. Heat butter in a cast iron pan and drop batter by the tablespoon, as you want to create silver dollar sized pancakes. Once the pancakes bubble up, flip and fry until both sides are golden. Repeat until all the batter is used up. Serve with maple syrup. This recipe should garner about 10 little pancakes. Yum yum,. these sound delicious! I am so sad I missed the apple festival. I hope they manage to keep the UBC farm going next year. HOOOOOOOOLY YUM!!! Fluffy pancakes are exquisite. I like your polaroid sx-70 shots…where did you get the film? ok, that´s it. 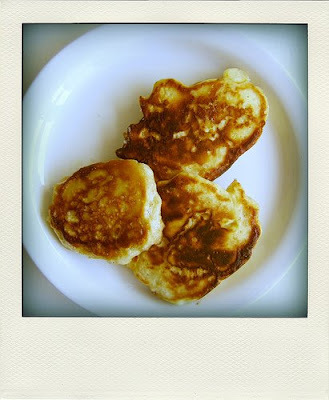 second time I see apple pancakes in 24 hours: it´s clearly a sign that they must be my breakfast tomorrow. oh these remind me of apply johnny-cakes. I, like you, fell in love with McCouns a couple years ago and now only buy those kind. I want to try new varieties, but get scared that I might not find them. awesome shots….they have a rustic yet simple feel to it? right? Nice… I am running to the store as we speak to get some apples for this… I can already smell the breakfast in the AM… Thanks!!! I’m not a pancake fanatic, but those look wonderful! love those polaroids! and the pancakes sound delicious. Another thing I know nothing about: Apples! I’m not really a huge fan of apples (too sour) and will only eat Macs on occasion. Ironically, my fridge is always stocked with apples because husband enjoys them. However, I never say no to pancakes and these sound perfect and delicious! Once I get settled into the new place I’ll have more time for pancake making. katerina, i hope so too! i’ve signed the petition, volunteered there and took a seed saving workshop! it’s a pretty wonderful place in the city. veggiegirl, yum is right! they are fluffy and fantastic. hag, ha! fooled you. it’s not a polaroid, but an online app called “poladroid”. it’s pretty fun! it is a sign, make them lobstersquad! dawn, i’ve never had a mccouns! i love trying new varieties, but sometimes they’re not the greatest. i tried a mutsu today and almost spit it out. more like muts-ewww! run quick, scott! they are delicious! jenna, i think these could definitely turn you into one! thanks caviar, they’re actually “poladroids” (an online app). but yes, the pancakes are the bomb. bijoux, these you should make! so good and your apple-lovin’ hubs would probably like them. I’m going to make this tomorrow for sure. Yes! I love recipes for two! And things with buttermilk. And apples. And breakfast. i just wanted to tell you i was drawn to your blog because i think i could survive on sandwiches forever. and i dig your blog, i’m going to keep reading. check mine out, too! I’m impressed with your pancakes, but dying over your apple description. They sound so good! I think the washing-out of the apple world is so sad. Who wants mushy, boring-tasting red delicious apples, anyway? I don’t understand. What wonderful pancakes! Anything that uses apples has got to be good. knitgrl, these are good! good luck on the squash hunt. sara, those are all my favorite things too! hanne, red delicious are my nemesis! worst apples ever.